Russian President Dmitry Medvedev tried to woo world economic leaders in Davos in January by boasting of significant improvements in economic conditions under his watch. 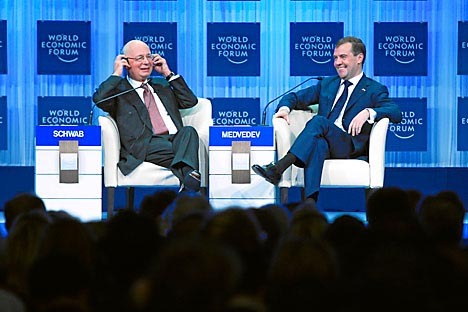 “Major changes have taken place in Russian society and the Russian economy,” Medvedev told delegates at the annual meeting of the World Economic Forum. “We are developing and we are moving ahead.” But against the backdrop of Monday’s suicide bombing at Domodedovo and the case of jailed former oil tycoon Mikhail Khodorkovsky, could his words potentially fall on deaf ears? In a keynote speech intended to reassure foreign investors and allay fears of political instability in the wake of deadly terror attack, Medvedev listed ten key areas where the Russian leadership is gradually strengthening the economy while also improving the investment climate. Items on Medvedev's list of achievements, crafted like a salesperson's laundry list of features and benefits, range from efforts to privatize dozens of state-owned companies to attempts to encourage foreign participation in the construction of sites for the 2014 Winter Olympics in Sochi. "The main goal is to make the companies themselves more efficient and improve the competitive environment for business in our country," the Russian president said, according to a full transcript of his speech posted on Forbes.com. Medvedev’s list spells out ten reasons why foreign investors should fall in love with Russia. Reason number one: Russia has slashed the number of its strategic companies fivefold – mainly those that cannot be privatized and those in which foreign investment is complicated, Medvedev said. The president first told delegates at the St. Petersburg International Economic Forum that he had signed a law that reduces the number of strategic enterprises from 208 to 41, in an effort to open up new opportunities to invest in enterprises that were once restricted to private – and especially foreign – investors. Reason number two: Russia is set to embark on a large-scale sell-off of state assets in efforts to modernize its country. The privatization program could see assets of such potentially attractive companies as the Aeroflot airline, television company Channel One, telecoms operator Svyazinvest, oil producer Zarubezhneft and oil pipeline monopoly Transneft in private hands. The government is expected to raise a total of one trillion rubles ($32 billion) from selling stakes in ten state assets by 2013, Economic Development Minister Elvira Nabiullina told journalists in November. Reason number three: president Medvedev said Russia is poised to create a “special sovereign fund” to attract foreign capital. “It may make sense now to think about creating a special sovereign fund that comprises state property and money to attract an array of private investments from abroad and within the country,” Medvedev said in an interview with Bloomberg Television on Wednesday. Medvedev first announced a plan to create an investment fund within a year at the St. Petersburg International Economic Forum last year, saying the fund would combine state assets and cash with private money. Reason number four: Medvedev reiterated that Russia will refrain from imposing a special tax on banks and the financial sector in an effort to attract additional capital into the country. First Vice-Premier Igor Shuvalov said last year that the government had no plans to introduce a special tax on banks, as it contradicts the strategy of creating an international financial center in Russia. Analysts said the move could give Russia some competitive advantages over other countries which are planning to impose regulatory restrictions on banks in the wake of the global financial crisis. Reason number five: the Kremlin is pressing ahead with efforts to transform Moscow into one of the top-ten global financial centers as part of a drive to diversify the economy away from energy exports. Experts say Russian largely undervalued blue-chip companies, such as Gazprom and Rosneft, could benefit in the form of higher market capitalization if they operate in a developed financial environment. Reason number six: Medvedev reaffirmed Russia's ambition to join the World Trade Organization (WTO) and the Organization for Economic Cooperation and Development (OECD), as well as to establish a common economic area with the European Union. “These processes are of major significance," Medvedev said. Reason number seven: Medvedev vowed to continue the implementation of energy efficiency programs, stressing that the state would also encourage more partnerships in the energy sector, such as the recent $16 billion asset swap and Arctic development deal between Britain's BP and state oil firm Rosneft. Reason number eight: Russia is presently developing a mechanism that would help it share technology – especially military technology – with other nations, as exemplified in a recent deal which saw France selling advanced military technology to Russia. France won a tender in December to build a Mistral-class assault warship, capable of transporting and deploying up to 16 helicopters, 13 battle tanks and 450 troops for a price of between $600 million and $750 million, RIA Novosti reported. "We particularly welcome the establishment of the Russo-French consortium to build helicopter-carrying ships," Medvedev said in Davos. Reason number nine: Russia continues to invest heavily in its human resources, including trying to educate future businessmen and officials abroad. But the Kremlin also wants foreign experts to feel comfortable in Russia. "Our task is to make Russia more attractive for foreign experts to work in," Medvedev said. "The inflow of foreign experts is needed to learn the best practices and create a good environment for the work of our experts. This is the reason we are willing to unilaterally approve diplomas and degrees of the experts willing to come work in Russia." Medvedev, an avid Internet user, also spoke out against initiatives that curb the freedom of the Internet before giving a surprise backing to WikiLeaks: "Despite the fact that those were probably illegal activities in view of some states, the effect of this affair appears to me very, very positive for international relations," Medvedev said. And finally, Russia is also pushing to interest investors in projects related to the development of sports and large athletic events in preparation for the Olympic Games. Russia will host both the 2014 Winter Olympics and the 2018 World Cup, and experts say both capital-intensive projects could greatly ramp up the quality of life in the country by bringing new levels of infrastructure. Russian officials met with investors on Wednesday in an attempt to interest them in buying into a $15 billion project to build five ski resorts in the North Caucasus, The Washington Post reported. The unlikely project, the paper writes, is called Peak 5642; Mount Elbrus, one of the sites, is 5,642 meters tall. President Medvedev had wanted to use the World Economic Forum to promote the modernization and investment potentials of the country, but had to shorten his trip due to the suicide-bomber’s attack on Moscow’s Domodedovo airport, which killed 35 people and injured more than 100. Such despicable terrorists acts, Medvedev said, could happen anywhere. "They expected their act would bring Russia to its knees," he said. "They expected and hoped that the president of Russia would not come here to attend this forum, among other things. But they miscalculated." But despite the horrendous terrorist attacks, experts say the only bug in the president's ointment is the case of Mikhail Khodorkovsky, the jailed former billionaire head of Yukos Oil, which continues to cast a shadow on the rule of law and leave a negative impact on Russia's reputation abroad. Ahead of president Medvedev's arrival in Davos on Wednesday, several European newspapers, including German daily Sueddeutsche Zeitung and The International Herald Tribune, published comments in which the former Yukos executive criticized the Russian leadership of manipulating the justice system to secure his recent sentencing. In an interview with Bloomberg television on Wednesday, president Medvedev did not exclude the possibility that prosecutors could file new charges against Khodorkovsky. "No one will have any doubts that the prosecution has the right to bring additional charges against persons who are in prison, no matter how this is perceived," Medvedev said. President Medvedev called for respect for the "national model of democracy," which he says is a blessing rather than disadvantage for a nation. "Russia is rebuked for the lack of democracy, authoritarian tendencies and the weakness of the judicial system," he said. "Today we are the way we are. Russia indeed faces many difficulties in building the rule of law. All of our decision-makers are not immune to ordinary mistakes. But one thing should be understood. We are moving ahead in fighting corruption and modernizing the judicial system, although we have not yet scored tremendous success. But we will persevere. We are ready to receive friendly advice, but we do not need lecturing."